14 April, London: Protest outside Israeli Embassy - Free all Palestinian Prisoners! Home Events 14 April, London: Protest outside Israeli Embassy – Free all Palestinian Prisoners! Protest outside the Israeli embassy as part of a weekend of action for Palestinian political prisoners in solidarity with the Palestinian struggle for return and liberation (including https://www.facebook.com/events/156553131709390/ on Tuesday 17th April – Palestinian Prisoners Day). Israel’s vindictive approach to arrests and imprisonment has continued with the jailing of over 300 Palestinian children; regularly subjected to torture, solitary confinement, and other harsh and inhumane conditions. Join us with banners, flags, placards and voices! Victory to the Palestinian Resistance! More than 6,400 Palestinian political prisoners today are locked up by Israeli occupation, including 62 female prisoners and over 300 child prisoners; regularly subjected to torture, solitary confinement, and other harsh and inhumane conditions. Over the past 3 years the number of child prisoners has doubled. In December alone, following Trump’s announcement on Jerusalem, Israeli occupation forces detained around 450 Palestinian children. Imprisonment has always been a weapon of colonialism in Palestine. From the British colonisers who suppressed Palestinian revolts through mass imprisonment, home demolitions, and execution – and who first imposed the “emergency law” of administrative detention used against Palestinians today – to the Zionist colonisers who for 70 years have imposed a system of occupation, apartheid, criminalisation, racism and dispossession upon the Palestinian people. “I don’t want a lawyer or any legal representation due to the fact that administrative detention is an illegal policy that denies me my freedom. There are no charges against me and my detention is based on a secret file that is controlled by the Israeli intelligence. I don’t want to be part of such proceedings in this place which lacks all forms of justice. I request for my lawyer to retreat from this hearing. (Salah Hamouri, (33), human rights worker – imprisoned under administrative detention – Jerusalem). Many Palestinian prisoners have engaged in hunger strikes in the past, demanding freedom and justice. They continue to put their bodies, health, and lives on the line daily in direct confrontation with an occupation from behind bars. Palestinian prisoners are not only victims of an unjust and oppres¬sive legal/military structure – they are part of an entire people seeking their freedom and liberation, including the end of occupation, the right of return of Palestinian refugees, and full rights for all Palestinians. 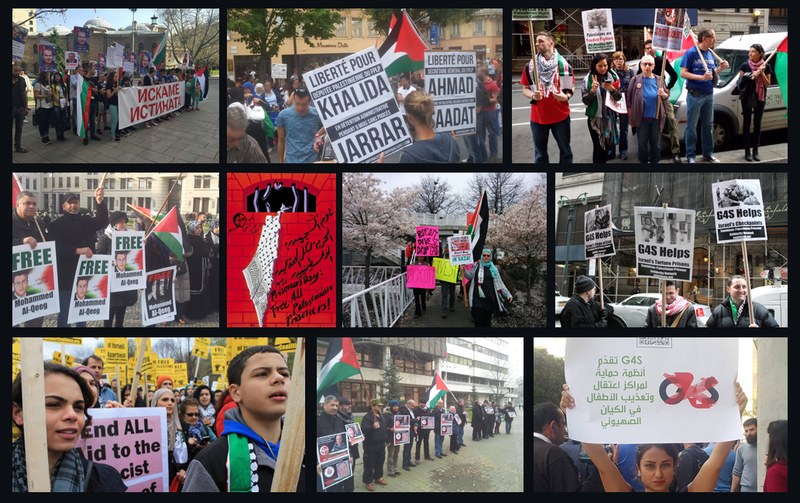 Join us on a series of events standing in solidarity with Palestinian political prisoners and the Palestinian struggle for return and liberation.